"Can I refuel on Deimos on the way to Enceladus?" "Can my mining laser be modified as a weapon?" "Can I build a microbial fuel cell for my drive?" 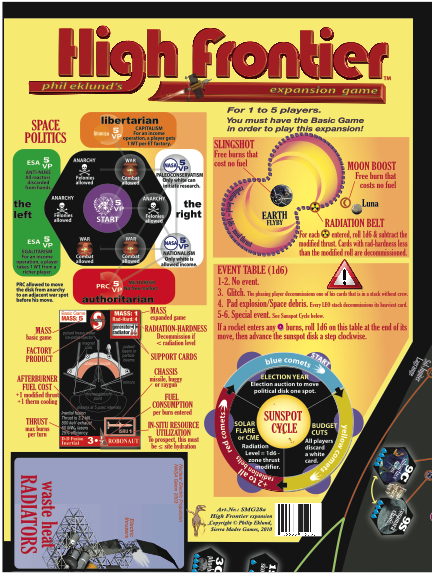 Expansion to the space exploration game HIGH FRONTIER, a comprehensive simulation of near-future exploration, which requires clever resourcefulness in a hostile environment. This expansion adds an extension that doubles the map, to include Jupiter, Saturn, main belt comets, & centaurs. An event cycle keeps track of solar storms and other seasonal dangers. The expanded rules include slingshots, radiation belts, piracy, combat, & space politics. There are also 24 new patent cards, representing reactors, generators, & radiators. The expanded scenarios include alien invasions, the solitaire game (Earth is threatened by an asteroid impact), and two short games.